Now in its third edition, Outdoor Learning in the Early Years is the complete guide to creating effective outdoor environments for young children's learning. 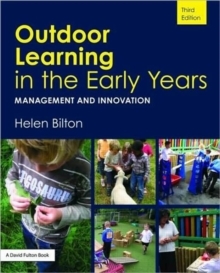 Comprehensively revised and updated throughout, this book covers every aspect of working outdoors in the early years and fully explains the importance of outdoor play to children's development. Key topics covered include:how to manage and set up the outdoor areawhat children gain from being outsidehow to allow children to take managed risksmaking sense of work and playhow outdoor provision helps children become self regulatoryproviding for both boys and girls in the outdoor environmentresearch supporting the outdoor approach. A book for practitioners at every level of their career; each chapter includes discussions and questions for continuing development that can easily be incorporated into INSET as well as training within further or higher education. Outdoor Learning in the Early Years contains a multitude of ideas and activities for working outdoors in the early years and provides a framework within which professionals can analyse and develop their outdoor provision and environment. This book is essential reading for all EYFS and Key Stage 1 practitioners, and for trainee teachers, their tutors, and mentors.